This is one of the most common questions we are regularly asked. You go to edit a photo in Lightroom and when in Develop mode you get a message that File Could Not Be Found. It must be so stressful and frustrating to find that your images are missing, but luckily there’s usually a simple answer to where they have gone. First you need to know that your images are not really in Lightroom. Lightroom is just a catalogue, like the old days in a library, where you had a little card that showed where all the books were stored. So too it is for Lightroom. When you want to work on an image you simply go through the digital cards and select the book, or image in this case, that you want to read. Yes you can make changes to your image, but those changes are only to the digital information or data of the particular image. The changes are only applied when you export that digital information as a file type that shows the data as an image, in this case either a .tiff or .jpg, or other file type that renders the data as an image. Sometimes when Lightroom cannot find that image you were working on, it’s as easy as going File / Open Recent and you will see the file you want. Most of the time though it will be missing from the Lightroom catalogue because you have moved the file or folder to another location. The common cause is when you back-up files to an external hard drive or you rename a folder. Remember when you imported the files into Lightroom in the first place, you needed to make, or choose, a destination folder on your hard drive that would store those files? 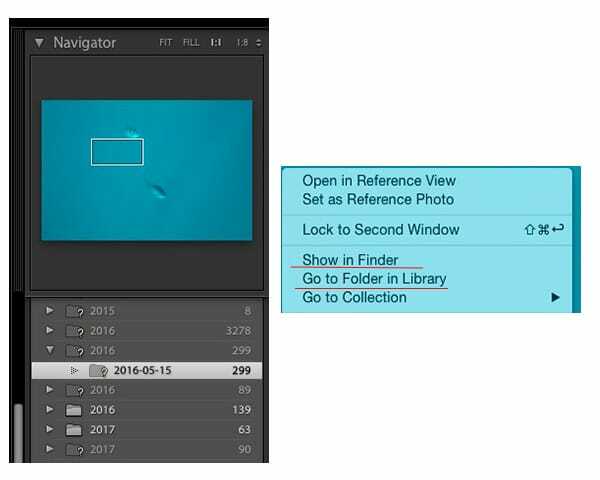 If you right click on the missing image in Develop mode and choose Go To Folder In Library, Lightroom will open the Navigator function and highlight the folder where the file was stored at the time of import. If that little folder image has a question mark over it, then this signifies that the folder is missing from the computers hard drive. If you backed up that folder to an external hard drive then you need to look there. It may be that you changed the name of your folder, moved the folder to a new location (external hard-drive) or deleted the folder (accidentally or not). The main thing to keep in mind is that when importing into Lightroom, the image files are not physically stored in the program itself, but into the destination folder that you chose. If you have shifted that folder or renamed it, then the Lightroom catalogue will not find the image or images you want to work on. The good news is your images are not usually missing or lost. You just need to look on your hard drive or external drive to find them.